While his ultimate conclusions are a bit extreme, perhaps, there has been a lot of debate on this topic for a long time now and this has served to kick it off again with some renewed vigor. You’ve heard all of this before: does technology really make all that big a difference when it comes to how emotionally gripping a story within a game can be, or is it a waste of time when we should be focusing on other things? Usually people end up in one of two camps: the folks who say that we should ignore photo-realism entirely in favor of better writing and cost-saving, simpler graphics, or the people who want more particle effects, more polygons, and more awesome eye-feasts to keep the gaming world fresh. As is usual for me, I’m going to eschew taking a hard-line stance on one particular side of this debate in order to make a dramatic headline for gaming news aggregates to latch on to because A.) I’m pretty sure gaming news aggregates don’t give a damn about what I have to say and B.) as usual, I don’t think either side is wholly correct; “Moderation is the key to moral virtue” and all that. I’ll start off by saying that I think Cage is at least kind of on the right track, he just might be taking a different off-ramp than the rest of us and heading towards a very different destination. See, the initial point he’s trying to get us on board with is that better technology can assist us in creating an emotional bridge to the player, and that’s spot-on. Human interaction is based largely on the reading of very subtle non-verbal cues in a person’s body language, much of that being found in the face where we can interpret something as miniscule as the raising of an eyebrow a few centimeter or two. The closer games come to replicating these small actions in their characters the easier it is for us to relate to them based on visual input alone. Just as an example, let’s look at two characters from games that were made just ten years apart. Here we have Meryl Silverburgh from Metal Gear Solid. Now, just from looking at that face, tell me what Meryl’s thinking right now. Is she cracking a joke? Threatening someone? Posing for this month’s issue of Unnecessarily Complex Plots magazine? You can’t tell, can you? That’s because the graphical capability of the Playstation in 1998 really wasn’t enough to allow characters to convey any kind of emotion visually. At least not using “realistic” graphics like MGS was using here. Characters like Crash Bandicoot could show some exaggerated cartoon-style emotions but nothing very human. 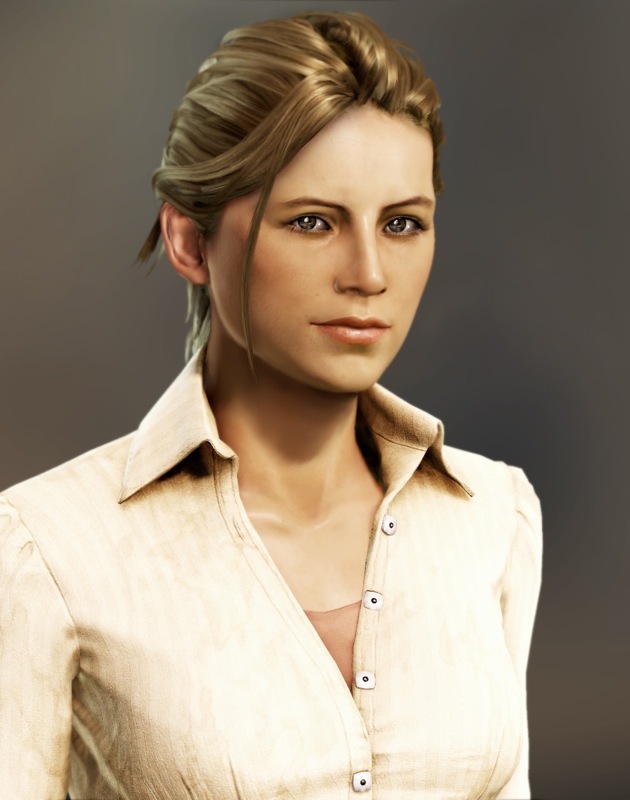 Now let’s look at Elena Fisher from Uncharted 2. Even though this is not much more than a promotional shot, look at the nuance in her face here: one corner of her mouth is just barely turned upward and one of her eyebrows is very, very slightly cocked, giving her a sort of subdued smirk. That slight smirk is pretty much the embodiment of Elena’s character, and you can get a pretty good impression of it just from looking at this still image. So you can see that a lot of what Cage is saying makes sense. Without the technology available through the Playstation 3 Naughty Dog wouldn’t have been able to convey all the small nuances of Elena’s character as effectively as they could have otherwise. This is one instance of technology contributing to make a character and a story more than what they could have been with lesser resources. The problem arises from Cage’s conclusions: remember that he doesn’t say technology just helps us achieve more emotional stories, he says that it is the principal and only means of achieving them in games. This is pretty much exactly the kind of thinking that corrupted Lucas when he made the Star Wars prequels: better technology should never, ever be the foundation upon which you attempt to build a meaningful story. That way lies disaster. The foundation for every good story has to come from (get this) a good story. You have to have an interesting tale to tell and memorable, developed characters or else all you’re left with is Attack of the Clones: a visually impressive piece with no emotional core that leaves you feeling bored and maybe a little angry. 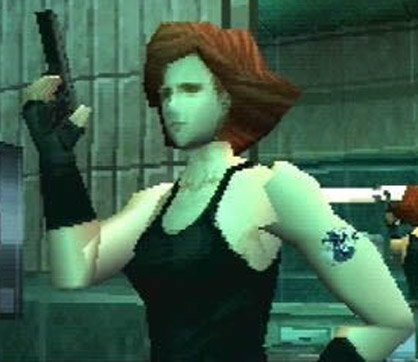 Going back to the earlier example of Meryl Silverburgh, remember that she wasn’t only in the original Metal Gear Solid; she showed up again years later for Metal Gear Solid 4, which played on the same Playstation 3 hardware that Uncharted did (albeit on a different engine). Despite all those years of technological improvements that allowed Meryl to be rendered in quality orders of magnitude greater than her initial appearance, she was still pretty much a boring, uninteresting, kind of obnoxious character. It’s the writing that makes Meryl nearly absent from my memory and Elena one of my favorite characters in games. It is most certainly not the technology. And remember that books have been tugging at our heart strings long, long before anyone ever figured out how to move a few pixels on a screen. Even within the medium of gaming one of the most powerful moments I’ve ever experienced was reading the on-screen text during Planescape: Torment. Good writing is always the foundation for emotional connection, not good visuals. So I guess what I’m saying is that the emotional core of a game can’t be found in its polygon count, but that the polygon count can be found in the emotional core of a game. Video games are a complex medium, incorporating more elements of storytelling than any other before it. It’s foolish to think that we can’t continue to improve on them, and creating more technologically adept visuals is one way to do that, but we just need to keep our focus. Don’t think for a minute that cold, unfeeling, but beautiful visual models are any replacement for well-written characters. We can have a good story without the former, but not without the latter. As long as developers keep that in mind we’ll likely see some really cool stuff in this next generation, and I’m looking forward to it. I agree – it really is about how each aspect of the game fits together to accomplish creating an emotional experience. And I think music is something that really gets downplayed in that relationship. I still get chills whenever I hear the Secret of Mana opening theme, or the Jenova theme from FFVII. What it really comes down to is whether or not the developer wants to create a deep, emotional experience. If they do, and are talented, they're going to be able to do that with the resources they have. If graphics were required, I wouldn't be having emotional experiences reading books. Indeed. It's one of the reasons why the indie scene is so interesting right now. With smaller developers and kickstarter-funded projects being produced on small budgets and without some of the more meddlesome oversight that can come with operating under a publisher, we're seeing some pretty cool stuff come out without all this AAA fluff: it's just people wanting to make good games.